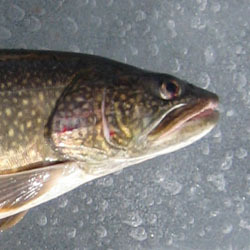 Lake Trout are native to Lake Simcoe, and natural populations date back to the times when the lake was joined to Georgian Bay. Although it is unclear if any native Lake Trout still exist, today's fishery is sustained by an annual MNR stocking program. With spawning site rehabilitation, and the closing of the Lake Herring / Cisco harvest, the Lake Simcoe Lake Trout population is healthy. This has been confirmed in recent years with the appearance of natural / unclipped lake trout in angler catches. The average lake trout is between 3-6 lbs, although some larger fish in the 10-15 lb range are commonly caught. 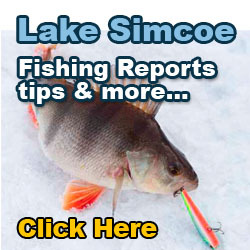 Fish in excess of 20 lbs have also been reported and are considered true trophy fish of Lake Simcoe. 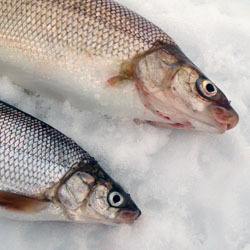 Most anglers target Lake Trout, during the ice fishing season and use both live bait and a variety of artificial lures. Some of the more popular hotspots, include Kempenfelt Bay, Big Bay Point, Long Shoal, Oro Beach and the deeper waters north of Fox Island. Target depths vary, although waters between 85-100 fow seem to produce the most trout. 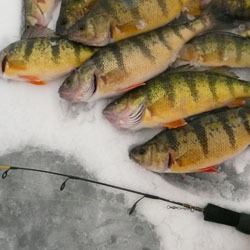 Tip-ups baited with lively minnows fished near the bottom or as high as 5-10 feet off bottom can be very productive, especially at early ice. 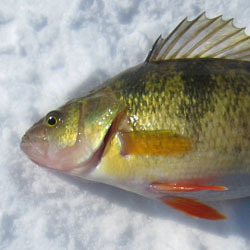 Jigging spoons, Like the Williams half-n-half whitefish spoon or Williams Warbler are also quite effective on active fish. Fish finders and flashers are an invaluable resource when targeting deep water fish, like Lake Trout. Fish can be actively seen chasing your spoons and sometimes reeling the spoons up and away from an active fish can entice aggressive strikes. 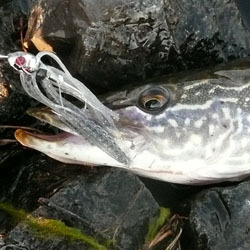 Recently plastic baits, such as white tube jigs fished vertically can produce on days when the trout are finicky. 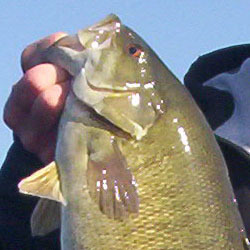 Badd Boyz and Meegs jigs rigged with small tube baits or live minnows, jigged near bottom have been successful at times. 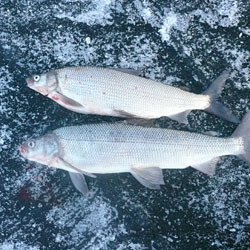 For more information about lure presentations and seasonal patterns for Lake Trout read Ice Fishing Lake Simcoe. 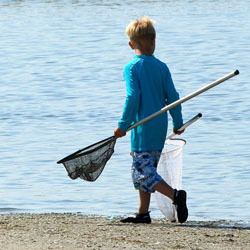 Spring is also a great time for trout fishing on Lake Simcoe. Most anglers use downriggers and troll water in excess if 80 feet, with large spoons. Trolling speeds are generally slower than those used on the Great Lakes for Salmon and Steelhead. 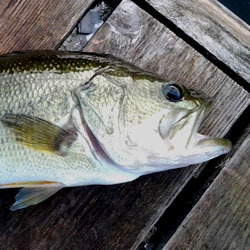 Areas with structure, near shoals and drop-offs seem to produce the most fish. 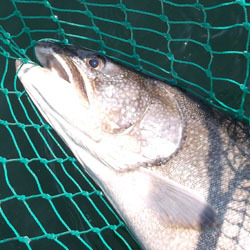 Please release the larger trout to help maintain a healthy lake trout fishery in Lake Simcoe.